The core of the apple is not the best or most delicious part, but it is definitely integral to the structure of the fruit. It keeps the skin and meat of that scrumptious Pink Lady that you’re biting into together, as a whole. The same could be said of your body’s core, or core muscles-that is. The bones of the spine provide the supporting frame for the back much like the innards of the apple. Connected to this frame is an intricate system of muscles and ligaments that increase the strength and stability of the spine, arms and legs. (1) Our core, composed of the spine and these muscles, keeps our bodies together, as a whole. 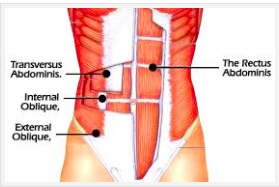 The transversus abdominis muscles is also important. As the name suggests, these muscles run horizontally across your lower abdomen or lower abs. Strengthening all of these muscles reduces the strain on your back and helps relieve or prevent back pain. A strong core also helps your balance, which prevents falls and enables you to exercise and conduct daily activities from lifting a heavy box to going up stairs. When the center of your body, your core is strong, you are able to move more as a unit with more efficiency, with less pain, and with increased fluidity. Not only does awareness of the core and its muscles help to alleviate back pain and potential injury, but exercising and moving the body can help as well-especially with maintaining mobility. Lie on stomach with your elbows directly under your shoulders and toes tucked in. Lift up your body, creating a straight line from your head to your feet. Make sure your shoulder blades are drawn together, your hips are not lifted too high or dropped towards the mat, and your lower abdominals are engaged. Reach out through your heels to help you feel the length of your body. Maintain the position for the 15-30 seconds. Now, the next time you are gazing at the Granny Smith apples at Trader Joe’s, take note of your core, your center. It is the key to living a life of increased movement fluidity and decreased pain.